What Do Emergency Room Nurses Do? Emergency Room (ER) nurses, also called Emergency Department (ED) nurses, provide nursing care in a variety of emergency and pre-hospital settings. They rapidly assess and stabilize patients in life-threatening situations such as heart attacks, strokes and traumatic injury. ER nurses also care for less critical illnesses and injuries such as sore throats, abdominal pain and broken bones. Care is delivered to patients along the full age continuum – from infants to elderly. Nurses who enjoy this specialty usually like variety and an ever-changing environment. Some shifts may be extremely hectic and others may be very slow. The situation can change in a moment so that within any given shift you may have a serious motorcycle trauma in one room and a baby with a stuffy nose in the next. ER nurses must know how to triage their time so that they give the most critical and time-sensitive actions priority. In addition, ER nurses must have excellent assessment skills and most know how to perform and read cardiac rhythms and 12-lead EKGs. These nurses assist in minor operative procedures performed in the emergency room such as suturing, chest tube placement, casting broken bones and intubation. ER nurses also spend much time educating patients about their conditions and explaining instructions for discharge. They must be kind and comforting to fearful patients and their families during uncomfortable or uncertain situations. 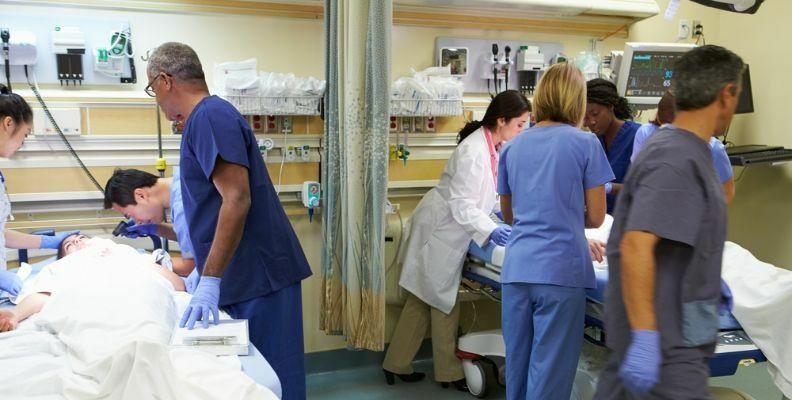 Although most ER nurses work in hospital emergency rooms, their skills are also needed in urgent care centers, poison control centers, telephone triage, military settings, prisons and cruise ships. ER Nurses assist at sporting events, camps, and colleges. Some emergency nursing positions require background in the field, especially during economic downturns when positions may be few. Nurses wishing to enter the specialty might gain needed experience through volunteering with local fire and emergency squads or requesting to ‘float’ to the emergency department while working another hospital unit.